A call center is the heart of customer service for many businesses, where customers call in for help and reps call out for sales. It’s referred to as a “call center” because traditional models of customer service are based on phone support as the main method of contact between customers and companies. A modern call center is often referred to as a contact center. Traditionally, a call center is an office where a large number of call center agents provide customer service over the telephone. Inbound call centers receive calls for customer support that are initiated by customers and prospects and often serve as a knowledge base for tech support, billing questions, and other customer service issues. These call centers focus on quick call resolution times and agent productivity. In outbound call centers, agents make calls rather than receive them. These could be sales calls, marketing offers, surveys, fundraising requests, or debt collection, for example. The term contact center (or contact centre) reflects the reality that there are many other ways to connect with a customer besides telephone. The combined trends of increased customer expectations and newer technologies that allow for many channels of communication are creating a shift in the traditional call center model which has existed for decades. Consumers want more ways to reach businesses, and businesses are looking for new ways to improve customer experience. While call center agents generally focus on inbound and outbound calls either on traditional phone lines or over VoIP, contact center agents handle a wide variety of communications. In a modern multichannel contact center, technical support might be delivered over in-app chat or video, while order status updates are delivered via SMS, event promotions are sent as push notifications, surveys are deployed over Facebook Messenger, and sales inquiries received by email are sent directly to an agent to connect by phone. An omnichannel call center takes the multichannel approach one step further and connects and integrates all channels of communication for a seamless customer experience. In short, the difference between a call center and a contact center is that call centers handle voice communications, contact centers handle all communications. Many businesses built their call centers with costly infrastructure that was expensive and time-consuming to install and customize. Most legacy call center systems take an average of nine months of professional services to make even the smallest changes. It's very hard to experiment, iterate, and improve a contact center under those circumstances. In the meantime, customer expectations continue to change rapidly as new technologies and communication channels become the norm. Today, a new approach to the traditional call center is available that allows businesses to deliver the caliber of real time customer experience necessary to win in increasingly competitive markets. Instead of taking an ‘off-the-shelf’ system from a telecom vendor and accepting inflexible systems with a monolithic feature set, this call center software approach enables companies to build the exact solution they need, when they need it. It’s an approach that offers more than updated technology; it re-envisions how call center operations are designed and built. Software based on APIs allow real time customer experiences over multiple channels (voice, chat, SMS, IVR, email, social media, etc.). They act as an automatic call distributor (ACD) that can route any task from multiple sources. The ACD recognizes an incoming call and scans for predetermined identifying information. This information is cross-referenced against a database of call routing instructions and distributes the call accordingly. The software maintains context of conversations and surfaces customers to the correct agent through computer telephony integration (CTI) and WebRTC. 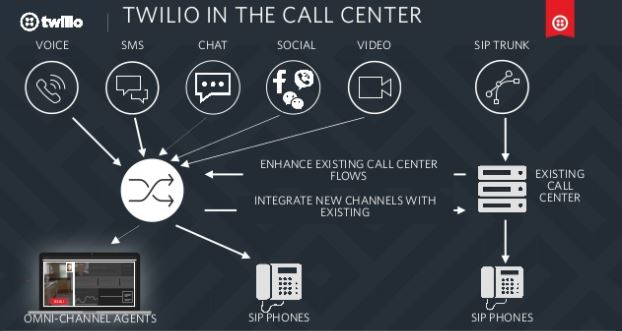 When you build your contact center with communication building blocks like Twilio’s programmable APIs, you can choose the channels and features you need and add more as your call center expands. APIs give you the flexibility to build the exact customer experience you want, and the freedom to iterate your IVR, call flows, and other aspects of your communications as frequently as you like. See also What is a Cloud Contact Center?